Dōtonburi is pretty overwhelming at night when there's queues everywhere. 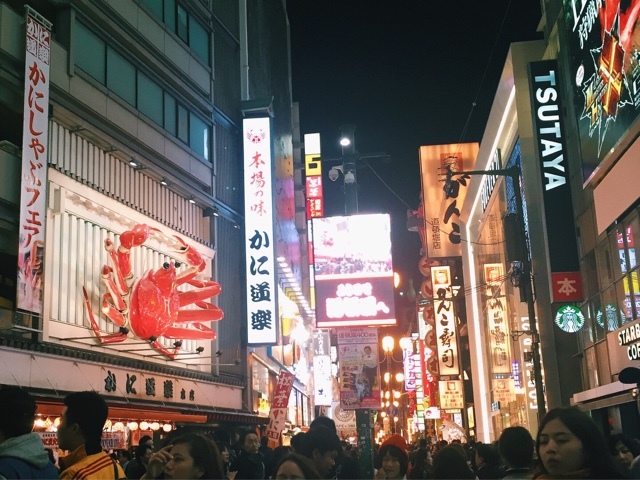 The area is a hub of nightlife, restaurants, shops and neon lights, paying homage to 3D seafood plaques and the Glico man. We weren't on a food mission (although we should have been) because of our un-strategic holiday planning. We ended up going to a random restaurant overlooking the canal for the best grilled eel though, after a stint of souvenir shopping. I went overboard in a souvenir snacks shop with mochi and giant Meiji Apollo. In hindsight, I should've got the rainbow Pocky and retro Pretz. Next time, next time. After dinner, me and Izzy decided to go karaoke. Just the two of us. Yup. Apparently, karaoke on your own is actually a thing in Japan and single karaoke booths actually exist, so we thought a 2-man karaoke room wouldn't be hard to find. And it wasn't. 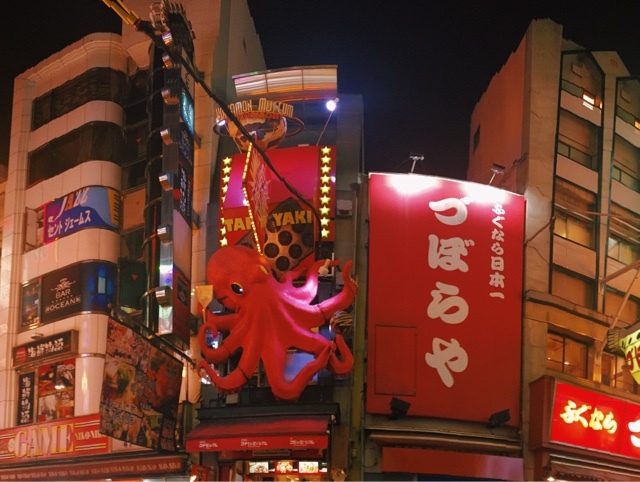 We picked a random one of many, and struggled with the pricing and room booking and free drinks and generally everything because of the general lack of English that Japanese speak. Our room was tiny, and literally just for 2 people, catered with 2 seats, a Japanese-only system (and pretty 'sick' reverb and bass) and some instruments. We were having technical issues with one mic and I kept on having to phone the reception with my limited Japanese of "Eigo o hanasemasuka?" (aka Do you speak English - which no, he didn't). But besides not understanding anything, we had a pretty amusing time and the English song choices were better than any karaoke place I've been to in England and Hong Kong. The place, albeit pretty crowded, makes for a nice night-time stroll when the crowds start dying down. We also hit up the 300 yen store and also got hot milk tea in a plastic bottle from a vending machine. Which is essentially kinda the same as going to a Poundland and just getting a hot tea from a coffee machine, but everything is just cooler in Japan. 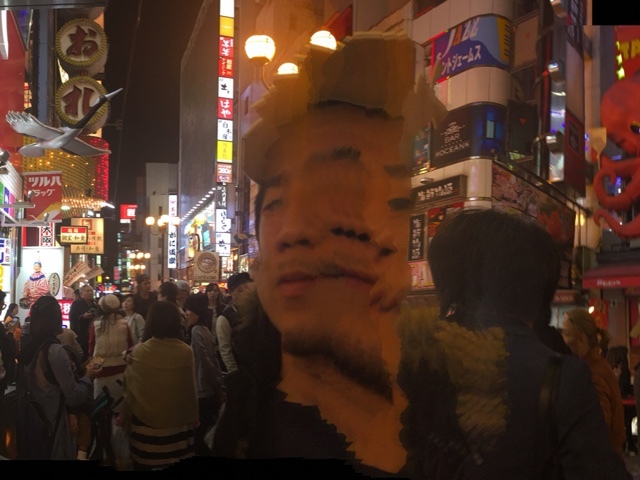 And, for the lols, below is when my panorama was photobombed by a thousand nostrils. a 3rd approach, and one thing well value considering if you've got been brooding about getting a grinder, would be to buy a mix occasional maker/grinder to form a really contemporary cup of occasional or a really contemporary espresso. Breville, Cuisinart, and Krups ar 3 brands well value considering. you'll in fact still ought to give $10 more or less for the milk frother.If you want to read more about Keurig Coffee Routes then please click here to continue.